The Z�rich tram network is one of the biggest in the country - natural for the biggest city in the country. 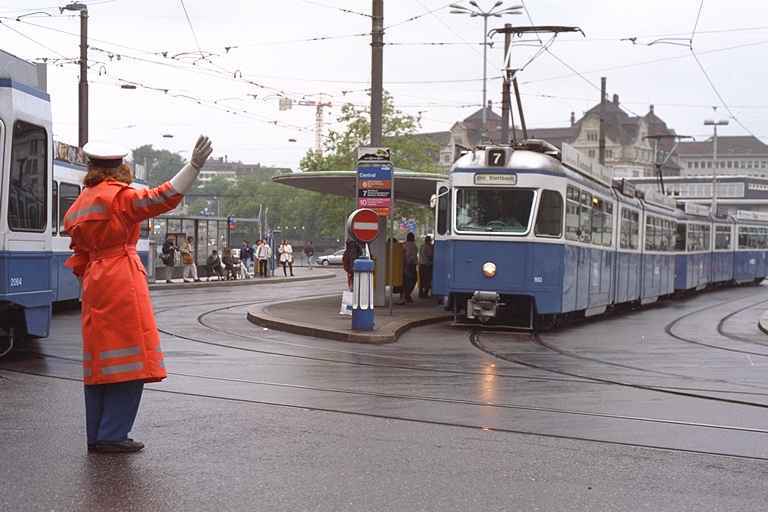 Now part of the communal traffic department, VBZ or Verkehrsbetriebe der Stadt Z�rich operates since 1. July 1896 a network of 1 metre gauge width throughout the city. Z�rich tram of the Be 4/6 type no. 1663 nicknamed "Mirage". These trams were built between 1966 and -68. It is 10,90 m long, weighs 25,8 tons and has a maximum speed of 60 km/h. VBZ has a total of 90 of these common wagons. Z�rich tram Be 4/6 no. 2021 of the so called "Tram 2000" concept series. 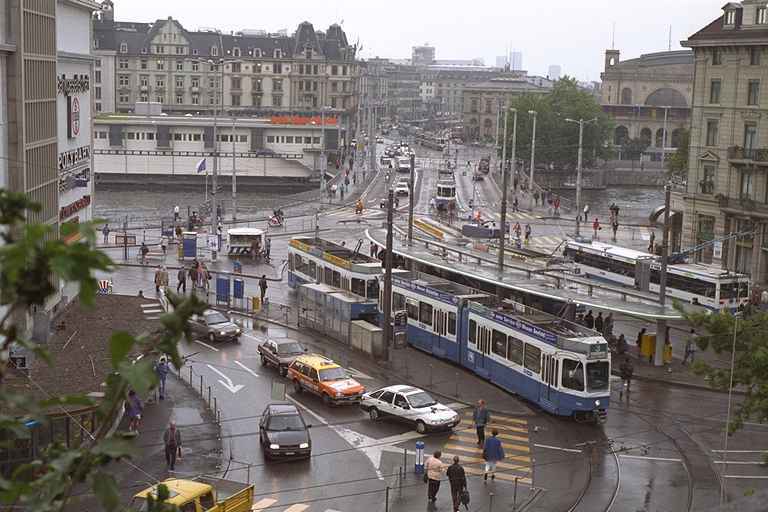 These are today the backbone of VBZ�s traffic on the most important routes. They were built in a series of 121 wagons between 1976 and 1992. The wagon weighs 25,5 tons (early ones 25,8t), it is 21,40 metres long and has a maximum speed of 65 km/h. Z�rich trams at the square called Central. 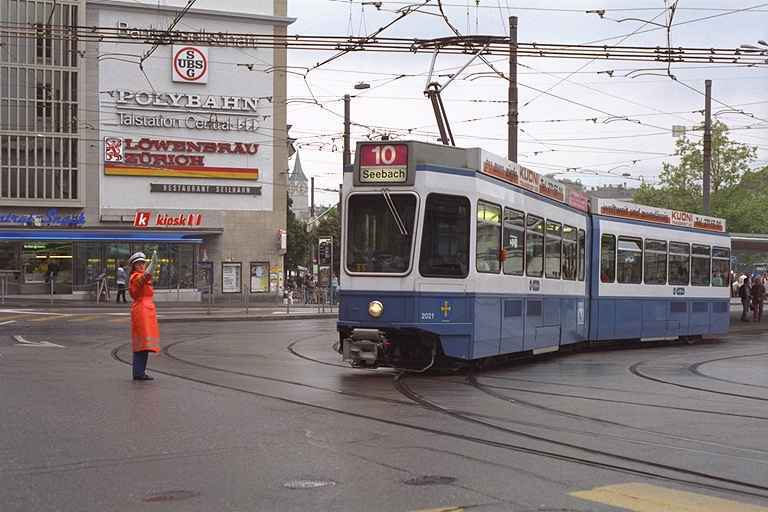 The tram by the tram stop is a "tram 2000" concept Be 4/6 which has one articulated joint. As a trailer it has another Tram 2000 concept wagon which has no bending joint. This is one of a very special series nicknamed "Pony". It is a motor wagon, but it lacks a cockpit - it is only used as a motorised trailer in connection with another Tram 2000 wagon. VBZ has both short (jointless, nicknamed Pony) and long (with an articulated joint like the normal Tram 2000 motorwagon but without a cockpit - nicknamed Blinde Kuh or blind cow) trailer motorwagons for the Tram 2000 concept. The "Pony" trailer wagon is 15,4 m long, weighs 18,5 tons and has a maximum speed of 65 km/h.